In thirteen rooms on the ground floor of the Kačina Chateau, visitors can view both representative salons and private apartments of the chateau’s owners. The centre of the ground level is taken up by reception rooms, while the private apartments are located at both of its ends. The apartment of the master of the house is on the left-hand side of the ground floor, while the lady of the house occupied apartments on the right-hand side of the floor. 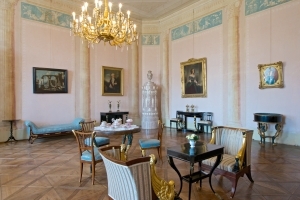 The rooms are furnished with period furniture, mostly of the Empire style, but in part also Biedermeier and Rococo Revival. Three quarters of the furniture and other furnishings are original, that is, these objects were used by the family of Counts Chotek. In some parts of the chateau, the original wall decorations have also been preserved. One of the most valuable exhibits is the larger-than-life-size portrait of the chateau’s founder, Jan Rudolf Chotek, with blueprints for the Kačina Chatea in his hand, or an Empire-style set of sitting furniture imported by the Choteks from Paris. The Kačina exposition is dedicated to this aristocratic family and their Nové Dvory estate. Against the background of changes which affected aristocracy as a specific class in the course of history, we can look into the daily private and public life of the male and female members of the Chotek family in the nineteenth and the first half of the twentieth century. This exposition is then supplemented by the Chotek library, theatre, and the service quarters of the chateau. These are located in the basement of the chateau and include, among others, a kitchen, laundry, ironing room, and other service rooms. The founder of the National Museum of Agriculture is the Ministry of Agriculture.